If you do a lot of keyword research — especially for PPC — you might want to check out a new tool called BulkWords. 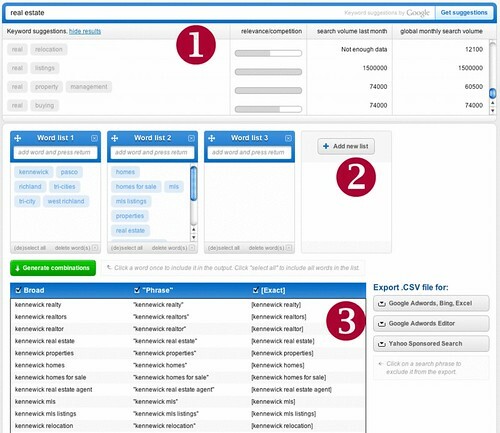 It combines a keyword suggestion tool and a keyword list generator into one interface that’s easy to use, not to mention easy on the eyes. Keyword suggestions from Google. This functions pretty similarly to Google’s AdWords Keyword Tool. It shows search volume numbers from the Google tool (although some of the “last month” numbers were different in my testing from what Google shows). List builder. This is where you start building keyword lists either by drag-and-drop from the suggestions above, or by typing in your own keywords. Keyword lists. After you’re done building keywords, the green button compiles them into lists that can be exported for use on Google, Bing, or Yahoo. BulkWords is free to use. You don’t need an account unless you want to save your lists for future use. It’s been created by a Dutch company called RevenApps. They’ve also made this short video that shows how it works. BulkWords, a webapp by RevenApps from revenapps on Vimeo. Do you think the Google tool is comprehensive enough? I think this kind of thing would be great if it also pulled from KeywordDiscovery and WordTracker to see a full complement of data. Thanks Matt. This is a useful tool for easily creating a comprehensive list of keyword phrases. A good addition to the keyword tools out there. Right now we’re using the Google Keyword API for suggestions but we might add other sources in the future. We would love to hear from users what they think of BulkWords. We want to make it the best keyword tool out there and we can’t do it with your feedback! We have a Get Satisfaction page where you can post idea’s, questions, bugfixes and praise :). As far as I know it’s the only tool that generates keyword lists based on Google Suggest suggestions. Any feedback would be appreciated! I was doing some Google Adwords setup yesterday and thought to myself, “I really wish I could mix-n-match any 5 words from this pool of 30 words which describe my product”. At that moment I figured I’d hit upon the next great app idea, but before setting out to write it I started doing some research for “Keyword generator” and “Keyword builder” and, lo-and-behold, I found Bulkwords via this blog post! I have gone through BulkWords and i agree with mithun that after using BulkWords i was simply having so many keyword to work upon. We should not end up with tons of keywords. I will advice you that in the end when some keywords and phrases are generated then there should be relevance factor that should be displayed . relevance can be on the basis of keyword popularity, originally searched term or you can add any 3rd factor that will make it much more easier to find our the relevant keywords out of the long list . Adding a relevance factor to the generated keywords is a great idea. Other users have suggested that too and were working on implementing this very soon, plus some other features (like language + country filtering for the suggestion box). If you have any other suggestions and feature requests, please do tell!